A flat tummy… it’s like the Holy Grail. While I commend people for wanting to feel healthy and look good, there is also an under-belly (haha, see what I did there?!) of fad tricks that are just plain unhealthy. Let’s go through 5 myths about attaining weight loss and achieving that flat tummy you’ve always wanted. I know it’s so tempting! The ads make compelling claims about the power of popping a pill, but don’t fall for it. There is no ‘magic pill’. Diet pills are more likely to burn through your pocketbook than to slim you down. A review of 12 different diet pills/supplements as well as statements from Mayo Clinic have warned of various side effects associated to using these methods. In addition, studies show that while some pills may help increase metabolism or lose weight, it’s almost a barely noticeable amount. In fact, some of them even tell you to follow a healthy diet and exercise while using the pill, so you’ve still got to put in the hard work for them to work!!! Myth #2: Do extra crunches to flatten your tummy. Excessive crunches aren’t the answer for tight abs or flat tummy. In order to achieve a toned look you’ll have to focus on burning off the layer of fat that is covering up your tummy. And unfortunately, there is no way to reduce body fat of a particular area (aka spot reducing). Instead you have to lower overall body fat. And you do that through exercising the entire body and eating right! Now, extra crunches will help strengthen your abs, but it also puts pressure on your spine. If you’re looking to do extra work on your abs, focus on working your entire core with moves like plank variations or stability ball rollouts. Don’t fall for the foods that are packaged as ‘diet’ or ‘weight loss’ aids. Quite often these products are packed with refined sugar and other artificial ingredients that your body doesn’t need, and certainly won’t help you attain that tight tummy. In fact, these “meals” are often detrimental to your end goals. Plus, what happens when you stop eating them? Or do you plan on paying for them your entire life? Myth #4: Avoid all carbohydrates in order to achieve tight abs. Carbohydrates have been given a bad rap, which is unfortunate because you can (and should) eat carbs while slimming down. The key is to avoid processed and refined flours and sugars. You should also eat carbs at the right time like after working out. That way, your body will utilize them right away to replenish your muscles instead of storing them as fat. Trying to lose weight by starving yourself is not only ineffective, it can also be dangerous. It may seem that severe calorie restriction would deliver the quickest weight loss. Perhaps at the beginning, it will yield you great results on the scale. But your body is complex and by starving it, you’ll disrupt your metabolism and actually slow your long -term results. Additionally, starving your body doesn’t allow for proper functioning or recovery. You may start to look slimmer, but what happens when you go back to eating normally? You’ll gain everything back and then some! And don’t think that you can maintain severe calorie restriction either because it’s extremely unhealthy. Step One: No more junk. The best way to do this is by purging your kitchen. Throw out the sugary, processed foods. Once the junk has been cleared out, don’t buy any more of it. This relates to having to lose overall body fat. The ‘junk food’ inhibits you losing body fat, so you want to limit it as much as you can. If you must have a little something, eat it soon after you exercise. Remember that your abs depend largely on what you eat – don’t eat junk! Replace the junk food in your life with plenty of the following: cooked and raw vegetables, fresh fruits, whole grains, moderate amounts of seeds and nuts, lean meats and low fat dairy. Clean eating really is that simple. Now, eating vegetables is probably one of the notions people complain about the most. I’m not saying you have to eat every single vegetable. But you should find ones that you do like and add more of them. Or even try cooking veggies you dislike a different way to see if that helps. It’s no secret that for most people working out feels like a punishment. Find a plan that excites you and intrigues you. That may be working out with a trainer who can expedite your results or joining a group class with your friends. Whatever you decide, make it a priority in your schedule!!! It shouldn’t get pushed down the list when something else comes up. This is your health we’re talking about! While exercise and healthy eating are crucial steps to achieve a flat tummy, there are also other aspects to deal with. One of the most important is lowering your stress levels. This is often overlooked by most people. When our bodies deal with stress, a chemical called cortisol is released. Unfortunately, cortisol tells our body to hold on to fat, especially in the midsection. How can you lower stress? Try meditating, yoga, or writing in a journal. Plus, if you’re exercising like you should be, your workouts can help relieve stress from work or home life as well. So, if you’re looking to acquire the Holy Grail of the fitness world, skip the quick fixes, gimmicks, and ‘magic bullets.’ Focus on eating better, exercising daily, and relieving stress to get that flat tummy you’ve always wanted! 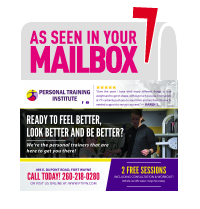 Hi, I’m Josh Davidson, owner of Personal Training Institute of Fort Wayne. I have been involved in health and fitness for over 7 years. I would love to help you start living a healthy lifestyle. You can learn more about my staff and I as well as how we can help you feel better by calling 260-338-2022 or visiting our website here. If you’re looking to start on your fitness journey now, sign up for a free consultation and workout today!